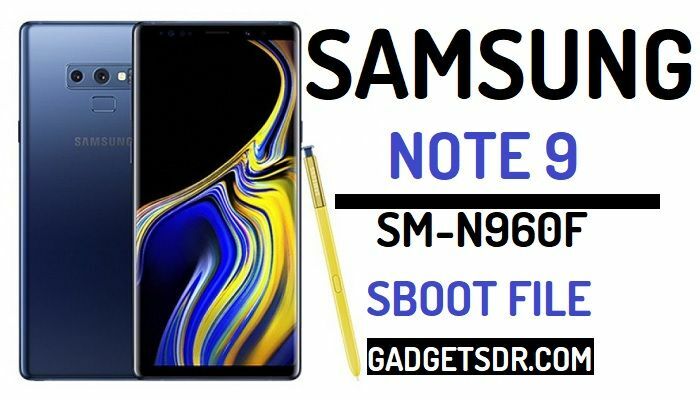 Download Samsung Galaxy Note 9 SM-N960F SBoot file to Bypass Google Account on your device. good news guys today on this page we share with you a latest Download Samsung SM-N960F SBoot file and the file version-N960FXXU1ARG5, If your device stuck on Google verification screen then you are on the right place to Bypass FRP Samsung N960F by flashing SBoot file, today we guide you step by step below to download Samsung SM-N960F SBoot file for and showing you to Bypass Google FRP, Download Samsung SM-N960F SBoot file help you to enable ADB (USB Debugging) mode remotely on your device. First of all, you have to download Samsung SM-N960F SBoot file from below and download Samsung USB Driver also download Samsung Odin flash tool latest, or any Samsung FRP Remove tool. Samsung SM-N960F SBoot files help you to Bypass Google FRP easily, follow this process step by step to flashing Samsung Note 9 SBoot file easily. Samsung Boot file is a Pre-programming file part of your device software, This file comes with “.img” extension, Samsung Boot file Booting your Samsung Galaxy devices and control your device, If you flash same model firmware then this file Re-write of your device system directory but if you flash wrong flash file or try to customize your device with a wrong way then this file will be erased and your device wouldn’t Power on your Samsung device. Then you need to repair Boot file of your device. So we thought that we share with you the latest collection of our Samsung Boot files for your device. and SBoot file working for enabling USB Debugging (ADB) remotely on your device. After the hard reset of your device then if your device stuck on Google Account Verification page then you need to Bypass Google Account from your device. and if you flash SBoot file then remotely USB Debugging mode will be enabled then connect your device to PC and Unlock FRP very easily. Before you try to flash this SBoot File on your Samsung SM-N960F device. Then Please First take a backup All your Personal Data on your Device. Here on this website, you will found all Samsung SBoot file for free. We, Will, provide you to download easily all Samsung mobiles SBoot files for free download. We will Provide you with 100% genuine link to Download all Samsung Mobiles SBoot files free download. If you face any Problems while you try to download files like “Dead Links / Broken Links / Damage Links ” Feel Free Contact Us. Our Team Tries to Solved your problem within 48 hours. -Samsung SBoot files help you to Bypass Google FRP from your device. -Samsung SBoot files help you to Bypass FRP Account from your Samsung Galaxy devices. -SBoot files help you to accessed home screen from your Samsung Galaxy devices. -Samsung SBoot file helps you to fix the FRP problem in your device. -Always download the same firmware version of Modem file for your device. to Bypass the Google Account from your device very easily. -Download the same Android version SBoot file for your Samsung Galaxy devices. -Flash the SBoot file through Odin, then enable ADB on your device than Unlock FRP by Software tools. -If you want Z3X latest professional tools with a loader, Visit here to Download Samsung Z3X tool with loader. -Before you do anything with your device we always recommended you to take back up of your Samsung Galaxy Device. –DOWNLOAD Samsung Latest USB Driver. -COPY all files in one Folder. -INSTALL Samsung USB Driver First. -Now Power Off Your Device. -Done… Now you have successfully flash SBoot File Samsung SM-N960F. -After Step 1 Done follow this Method. -First Power On your Samsung SM-N960F in Normal Mode. -Open Z3x or Try Our Samsung ADB FRP Remover tool. -Open Z3x Box then Select your Device Model. -Then On Z3x Box find and open ADB Tab. (Z3X ADB Box, ADB will show automatically due to flash SBoot File before). -Then Click on RESET FRP tab. -When Done Restart your Done. -When your Device power On Setup your Device. -Samsung N960F Frp Reset Done.